A Note on Sports: That's Right...Sports! John Hodgman, in one of the many introductory notes to his engaging pseudo-almanac, The Areas of My Expertise,1 writes, “Please note that there are only two references to sports in this book. They are on pages 71 and 95, and both are appropriately dismissive. If you wish for sports information, might I kindly refer you to every other aspect of our culture?” I’m convinced that a) Hodgman is a secret alumnus of the School of the Art Institute of Chicago, or b) something resembling his “Note on Sports” is scrawled on the wall of at least one bathroom in the Michigan building. So I decided to explore the sports scene at SAIC, to determine if the term “sports scene” was even applicable. I loosely defined “sports” as maybe a team activity, with a ball or a Frisbee, or some sort of goal in mind that goes a bit beyond self-awareness and satisfaction. Excluded from this idea, in my mind, are “activities” like yoga and belly dancing, about whose existence and value at the school I have no doubt. No, what I was looking for was something that spoke to the urge for sport in a place where jockeying for a spot in the elevator is usually the day’s sweatiest engagement. And so I discovered that there is an Ultimate Frisbee team at SAIC.5 I spoke with the team’s founder, sophomore Tristan Hummel, and he was excited. He told me that, while the team didn’t have the money to go anywhere last year, its first, they had recently played in their first tournament, in St. Louis. Team members paid for their own train tickets and they made their own way.6 “We got into St. Louis at midnight,” Hummel told me, “and we played the next day from nine until nine. We were pretty beat.” He laughed and raced through a rough play-by-play of the weekend. “We actually got destroyed,” he concluded, without a hint of displeasure. Pursuing the art of tactical sportfare at SAIC isn’t without its trials. When I asked Hummel what it was like to found a Frisbee team at SAIC, he replied, “‘Difficult’ is a good word for it.” Among people that I spoke with, a recurring theme seemed to be either the difficulties that came with starting up an organization, or the difficulties that came with letting people know that they can, in fact, start up an organization. “A lot of students make informal mention of wanting to be involved in sports,” said Tara Sullivan, the Director of Campus Life. “Why it isn’t translating into people wanting to start student groups on their own, I’m not positive.” Sullivan stressed to me that students have the chance to start a sporting group, and to in turn take advantage of group email accounts and funding. Hummel, on the other hand, expressed some amount of frustration with student groups, and preferred an easier way to notify the student body about possible opportunities and events like, for example, Ultimate Frisbee games. As this might, on the one hand, seem a frustration, I’ll provide another perspective. Sports fans and players are constantly on the search for a “purer” form of a given sport. This Purity Quest explains recent uproar about excessive steroids in baseball, excessive headbands in basketball, and excessive Tartan plaid in middle school girls’ field hockey. What guys like Tristan Hummel achieve—along with the elusive but apparently well-received dodgeball games that go down…somewhere7—is an act of sport, of Frisbee, brought about almost solely through a sheer force of will. That’s pretty pure. “We are a tight-knit group of people who are willing to invest themselves,” Hummel said of his Ultimate crew. “Lots of people who are here tend to stick to a plan, and are pretty motivated, they show up when they say that they will show up.” Networks of friends, and friends of friends, are the largest contributors to growth. And while I won’t suggest that this isn’t the case with athletes elsewhere, at SAIC a statement like that, in reference to sports, glows with a kind of heroic sheen. Well, I think it’s heroic, anyway. In the meantime, though, the only meetings that will matter will be out on the field. Wherever the hell that might be. 1 He’s the guy who plays the sniffly PC in the Apple TV commercials. 2 I’ve long been formulating a persuasive art historical comparison between the collected works of Edouard Manet and the collected works of Brett Favre. 3 That’s a pro baseball team, from Houston. Wang Shugang’s early 2006 exhibition at the Walsh Gallery included “dead animals on Astroturf” that wouldn’t have been possible without the Astros. 4 The conversation, at the very least, in my own head. 5 The listing of school groups that I found included a robust two organizations whose goals seemed sporty. 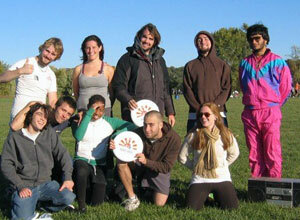 Ultimate Frisbee was one. The other was a bowling club of some sort. 6 Some impressed fellow participants even chipped in a few bucks towards the team.